I finally made it out to one of DC's premier indie rock venues, DC9. Ironically, tonight did not feature local bands but instead was a dance party typical of their weekend nights. Ok, I'm being a little harsh. I'm just not a dance person. I had a good time and the bartender/co-owner Josh was very cool to us. DC9 attracts a diverse crowd, much of which are made up of very chill people. I'm looking forward to checking it out during the week for a different experience. Amazing pictures of the crowd by Josh Sisk here. Shout outs to T-Bone, Stiletto, and The Flash. I would pay good money to see you guys gyrating to 'soap and water' remixed. The first snowfall of the year fell on Monday, but it was just inconsistent flurries. Today about two inches of light snow blanketed the region as temperatures danced just below freezing, making the drive home interesting but not dangerous. Tomorrow morning is supposed to have relentless freezing rain and sleet, so I'm worried about everyone's commute. Northern Virginia and DC is especially vulnerable to being shut down by icy roads or just a little heavy snow. With the usual techo beats echoing off the basement walls of Eleventh, my friends somehow started a impromptu dance-off. My cell camera was not fast enough to capture the talent and hilarity of the spontaneous dancing duo, but it was a fun time for everyone. 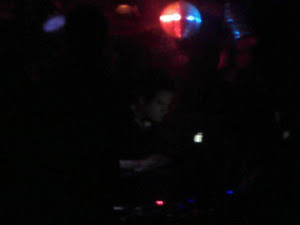 The atmosphere and the friendly crowd at Eleventh once again did not disappoint me and I will be back again next week. North Highland street between Washington Blvd and Clarendon Blvd is closed today due to construction. 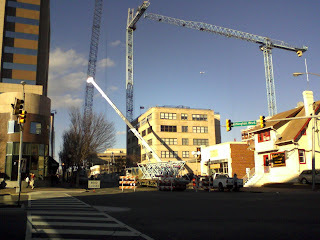 Looks like they are building two more cranes to continue the razing of the new Clarendon Center next to Clarendon Grill. Hope this clears up before tonight or else it will severely hamper nightlife traffic. 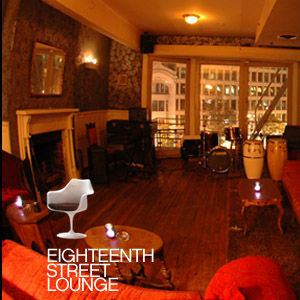 The top floor of 18th Street Lounge featured a great Jazz ensemble tonight. A double bass, drums, keyboard, trumpet and trombone alternatively filled the venue with mellow grooves. Its a great place to appreciate some good Jazz as long as you can steal a seat and ignore the drunkies. 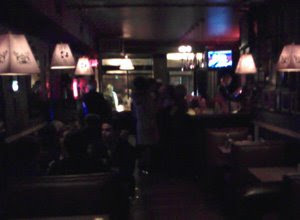 The second floor played reggae and house dancing music, which of course I'm not that found of since I don't dance well. True Womanhood opened up the back stage at Black Cat tonight. A new indie band called Pow Wow, lead by the multi-talented shoe-gazer Mary Timony, followed them. I liked TW's experimental indie tunes, with one of their songs (wish I could remember its name) having Radiohead-like overtures. But the most enjoyable aspect was Melissa's thumping bass tunes. I wasn't a fan of the people waving streamers in the front row the whole time. Its cool that TW has support from friends to come out and participate in the show, but it seemed gimmicky. And their music could stand on its own without gimmicks. And also, if you do ever wave streamers in front of a band's show, please please please wave them in accordance with the current beat of the song. Its fairly annoying when TW was playing a mellow tune and the streamer people were going crazy with their sticks and ribbons. True Womanhood at Black Cat this Saturday! 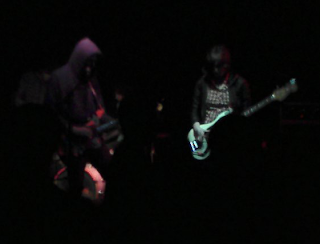 Looking forward to True Womanhood's experimental indie beats at their third performance at Black Cat this weekend! I missed their last appearance, and was disappointed that I wasn't able to see Melissa's bass riffs in person. Made my first visit to the dramatic Russia House on 1800 Connecticut Ave NW. I really enjoyed the atmosphere of this converted three story townhouse. It is an upscale lounge with a bar on every floor serving enough vodka to make Stalin proud. Oh, and all the waitresses are hot, unapproachable Ruskie girls. I really want to go back, but will probably stay away from the Russian Mule. Even though its the most masculine martini, it will keep your insides as warm as a Siberian winter. The females in your party will be delighted by the decorative hearts drawn on the Sputnik martini. Its a pricey lounge, but offers a very different experience than say, I don't know, the Royal Palace across the street. 2008 is over, and looks like I've seen 35 live performances in Clarendon this year. Pretty good, but hoping to attend more next year. Turned out to be a lame New Years Eve this time around. Anybody want to trade crappy New Years stories?